After spending a couple days with Tumi in Maseru, we got a good sense of the opportunity in front of him. Having the chance to meet with a prospective Sister Shop owner and see their situation first hand is a luxury we’ve never experienced. We got a chance to see the market potential, get a sense for how interested people are in bikes and what they’re able to spend, check out the existing bike and parts supply and see the location Tumi has proposed. We spent two and a half days touring the city by bike and based on the reaction of people as we rode past, Tumi should do quite well. People were very curious and excited to see our peloton cruise by. Often rolling through with a pack of 10-15 people, we were quite a sight. Every school we passed produced cheers of “bicycle, bicycle” as the kids ran to side of the road to watch. Often the teacher would recognize Tumi from the work he’s done with the local kids and give us a big smile and wave. When we were in more crowded parts of the city, Tumi seemed to know everyone and would tell them “these are the guys I was telling you about, I’ll have bikes to sell soon!” Tumi’s success with racing over the years has made him a bit of a local celebrity. He has a couple newspaper articles about him on the wall of his small workshop. 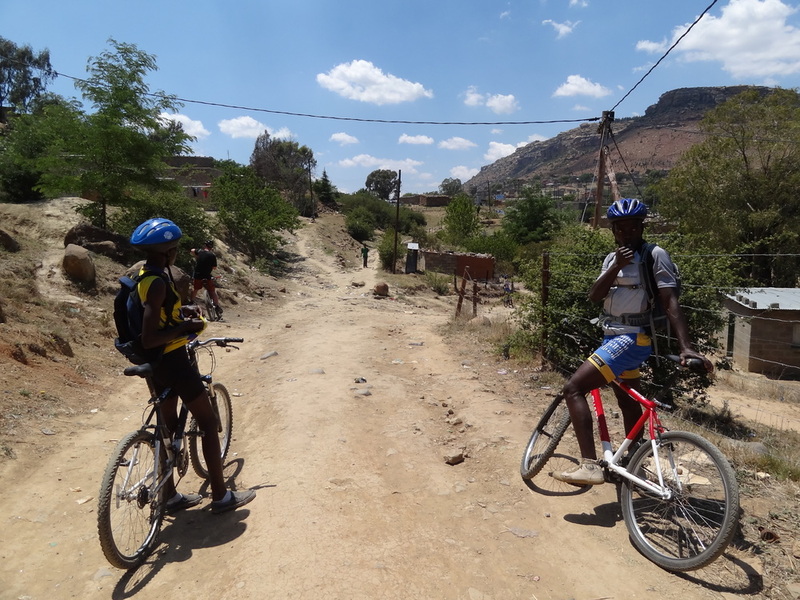 We found out towards the end of our trip that he represented Lesotho in the Commonwealth Games for cycling! So with the amount of interest in bikes for transportation and recreation, combined with a city perfectly suited for getting around by bike, we feel the sky’s the limit for Tumi. 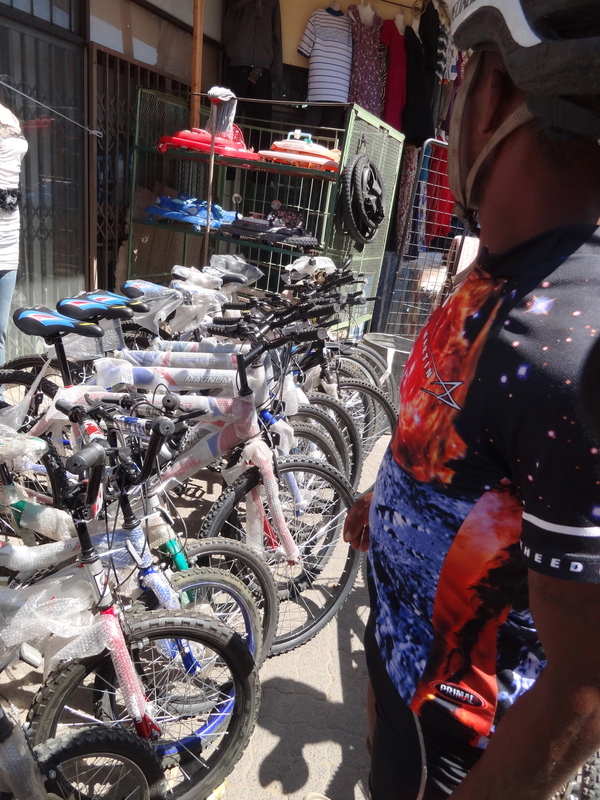 Tumi showed us his "Wall of Fame"
In order to make our Sister Shops sustainable, they have to be able to buy bikes and sell them with enough markup to stay in business and grow. That means their customers have to be able to afford to spend a certain amount on a bike. After the initial inventory donation, we require the shops to cover the cost of shipping the donated bikes from California as a step toward true sustainability. The total shipping cost and import duties for the container, divided by the number of bikes inside, usually comes to around $40 each (why it’s so important for us to pack as many as possible into the container). So with an assigned cost of $40, Tumi will need to sell his bikes for $50 to $100, depending on the condition, quality, and features. After a bit of market research, we determined this would be possible. As we’ve seen in other markets where we have Sister Shops, there is availability of what are derisively referred to as “China bikes”. These are usually relatively expensive and always of extremely poor quality. And they are sold in what’s referred to here as “China shops” that also sell a myriad of other non-bike things. There is zero support from a service or spare parts standpoint, which is a necessity for bikes this junky, so most people just choose to walk. Maseru is no different, there is one of these stores in town and based on the condition of the 6 or so bikes lined up outside, we guessed they had been sitting there for quite a while. The plastic front wheel of one kids bike appeared to have been stepped on by a passer-by and it was broken completely into two pieces, but still out available for sale! These bikes were priced at $80 - $120, prices that a good chunk of the population could afford, but would consider a waste, knowing that these bikes won’t work and won’t last. The local people are hungry for real bikes, are able to afford Tumi’s bikes, and are just waiting for them to actually appear here. In order to complete our picture of Tumi’s chance of success, we had to see where he planned on putting his shop. 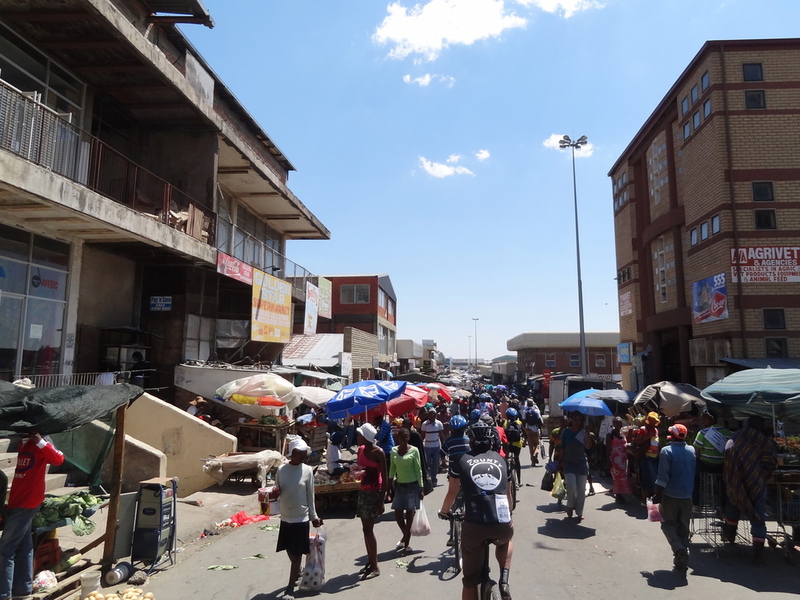 Maseru is a much less developed city than Gaborone or Bulawayo. There is retail space to rent but there is also a solid “roadside” economy where people sell wares by the side of the road either in a little stand or on foot. As we know all know too well back home, spending too much money on rent means certain failure. So Tumi has decided to do a containerized store on the property of his godfather, Mr. Sello. Mr. Sello owns a security company just outside of downtown, but directly on the main road into town. His office is a small building set back from the road a bit and he has offered to let Tumi put his container in his “front yard”, rent free! This is huge. And while a containerized shop is a step down from a proper retail space, not having to cover a large monthly rent expense increases Tumi’s chance of success dramatically. If things go well, he can always move into a more typical retail space. Add in the fact that Tumi’s bikes will be safely stored on the property of a security company, and you can see why we feel this is a perfect place to start. So with a captive market starved of proper supply, a customer base that afford to pay a reasonable amount for a good bike, and a good enough location with no rent, we feel the situation is ripe for Tumi’s success. Couple this with Tumi’s boundless energy, passion for bikes and his “celebrity”, it was time to set a plan to get him open!